We are a leading Exporter of ceramic cloth with vermiculite coating from Ahmedabad, India. 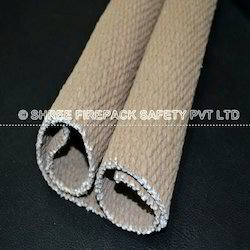 Catering to the demands of customers as a reliable organization, shree firepack safety pvt ltd are providing Vermiculite Coated Ceramic Cloth. These products are applicable in fire blankets, fire curtains and expansion joints. Post-production, these ceramic cloths are checked on various parameters to ensure defect-free range. Other Details: It is a soft, flexible cloth made of ceramic fiber yarn reinforced by steel wire with vermiculite coated. It is an ideal replacement for asbestos product used for thermal insulation and heat protection. It will not burn, rot, mildew or deteriorate and resist most acids. It has low coefficient of thermal expansion and is suitable for temperature up to 1050° C.
Looking for Vermiculite Coated Ceramic Cloth ?